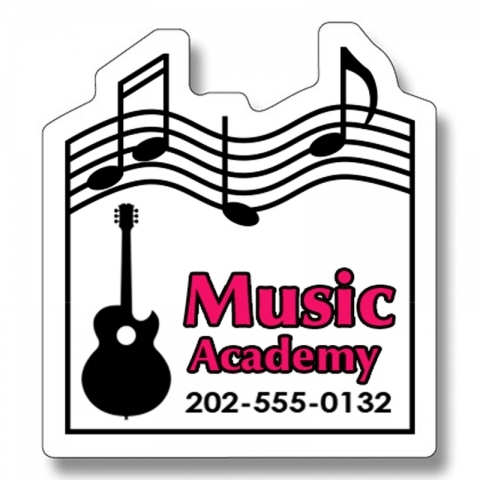 Make sure everyone is dancing to your tunes by employing this custom 2.25 x 2.5 musical note shape full color magnet. By gifting this music themed shaped full color magnet you can ensure that your business is on minds and lips of targeted customer base. Perfect for recording studios, music stores, entertainers, country music club, or bands for promoting their brand value and raising their popularity. This magnet looks wonderful from over the refrigerator door or cabinets within home or office due to its shape. Request a quote to know price savings on mass orders of this customized music themed full color magnets. Product Size: 2.25 in. x 2.50 in.